The village cinema is proving to be very popular, and as well as providing a service to the community it is also a source of revenue which will go towards the development of the new Dersingham Village Centre and Village Hall. The next film to be shown is Still Alice, starring Julianne Moore, Alec Baldwin and Kristen Stewart. A linguistics professor and her family find their bonds tested when she is diagnosed with Alzheimer’s Disease. The date for the screening is Friday 13th November at 7.30pm. 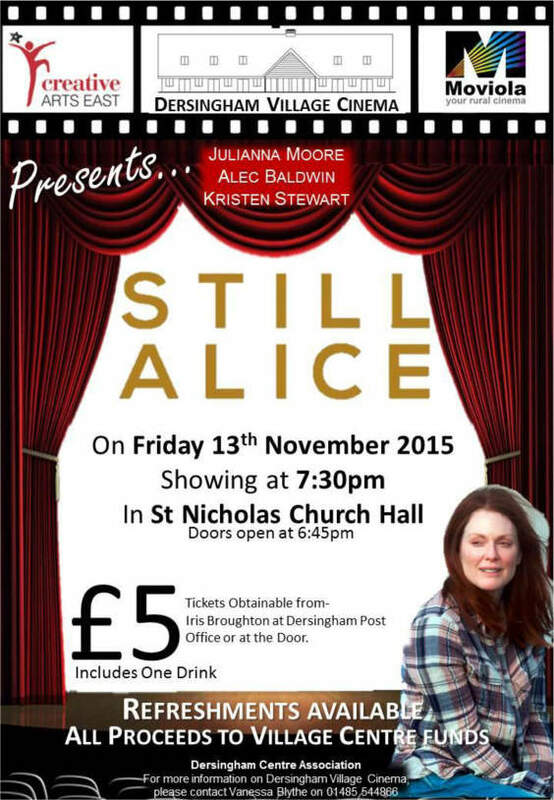 As usual, the cinema will be in St Nicholas church hall. Do try and support these events, because each one brings the finishing line for our fundraising a little closer.